Penncrest guard Justin Heidig is defended closely by David Angelo of Bishop Shanahan during the third quarter of the District 1 Class 5A championship game Saturday, March 3, 2018, at the Liacouras Center at Temple. Penncrest went on to win, 50-28. After the roads are cleared from Wednesday's snowfall, local basketball teams will continue preparing for the state playoffs. Forty-four squads from the area — 24 from District 1 and 20 from District 12 — are bidding to make it to Hershey's Giant Center and earn PIAA championship medals. Here is a look at the Class 5A, 3A, and A tournaments, with a predicted winner in each group. We'll cover the Class 6A, 4A, and 2A playoffs in Friday's paper. Penncrest, which successfully defended its District 1 title, is eager to make up for last year's first-round loss to District 3's Hershey. 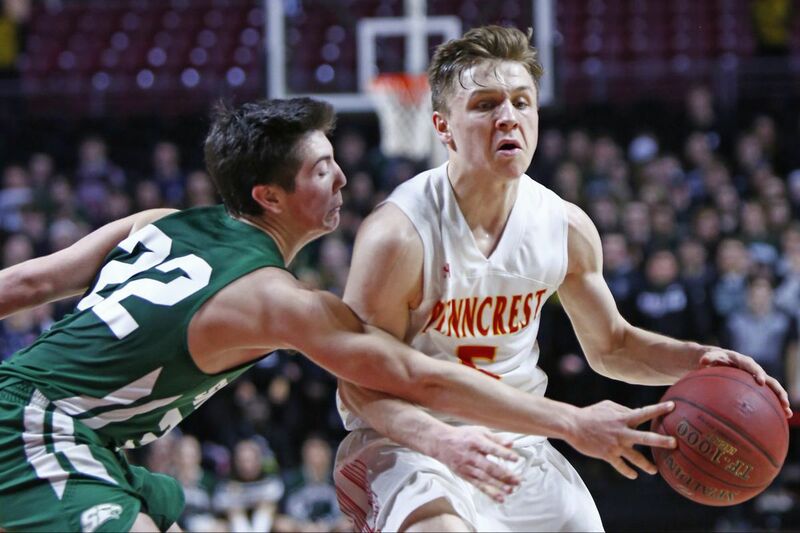 Penncrest’s Tyler Norwood shoots over Bishop Shanahan’s Phil Chenard. Mike Doyle's squad is paced by Tyler Norwood, a senior guard who is averaging 21.7 points and has made 59 three-pointers. The Lions open against District 3's Shippensburg. Bonner-Prendergast’s Isaiah Wong (21) passes the ball against St. Joseph’s Prep. Bonner-Prendergast is likewise a contender and is spurred by an imposing trio: guard Isaiah Wong, the Catholic League's most valuable player, 6-foot-8 Ajiri Johnson, and 6-9 Tariq Ingraham. Martin Luther King, which fell to Bonner-Prendie in overtime in the District 12 final, has a lineup headed by guards Denelle Holly and Ricardo Monteiro, and 6-9 center Will McNair. M.L. King takes on Chester, which placed fourth in the District 1 playoffs, in the first round. The Clippers will need strong efforts from guards Michael Smith and Brian Randolph to upend the Cougars. Archbishop Carroll and Wissahickon were placed in the Western bracket and square off in the opening round. Other squads to watch in the bottom half of the draw are District 7's Mars, District 3's Milton Hershey, and District 11's Bangor. Mars is sparked by Robby Carmody, a 6-4 senior and Notre Dame recruit who is averaging 32.2 points and 14.2 rebounds per game. He is supported by junior guards Andrew Recchia (12.3 ppg) and Cade Hetzler (10.9). Our final four: M.L. King, Bonner-Prendie, Archbishop Carroll, and Mars. Champion: Wong and the Friars nip Carmody and the Fightin' Planets in OT. After failing to advance to the Catholic League semifinals for the first time since 2008, Neumann-Goretti looks to rebound and bring home its fifth straight state championship to South Philly. The Saints' top challengers in the Eastern bracket are District 3's Trinity, District 2's Wyoming Seminary, and District 1-11 subregional titlist Valley Forge Military Academy. Trinity is led by 6-11 senior Sean Good. The Lafayette recruit has posted more than 1,000 points, 1,000 boards, and 500 blocks in his career. Teams to keep an eye on in the Western bracket are District 7's Lincoln Park and Seton-La Salle, and District 10's Fairview. Fairview's Sam Parini is a 6-10 senior who is bound for Army. Neumann-Gorett’s Chris Ings shoots over Plymouth Whitemarsh’s Ish Horn. Our final four: Neumann-Goretti, Trinity, Lincoln Park, and Seton LaSalle. Champion: Neumann-Goretti, behind fearless guards Chris Ings and Dymir Montague, tops Seton LaSalle. Locals Faith Christian, Sankofa Freedom, and Girard College all have a chance to make it out of the East. Faith Christian’s Darius Forney drives on Girard College’s Brandon Smith. Defending state champ Kennedy Catholic, of District 10, is powered by 6-10, 230-pound forward Oscar Tshiebwe (22 ppg), 6-5 guard Maceo Austin (18 ppg), and 6-7 wing Mattia Acunzo. Our final four: Faith Christian, Girard College, District 7's Vincentian Academy, and Kennedy Catholic. Champion: Kennedy Catholic beats Jones and the Cavaliers in a rematch of last year's final.